Defined by its emotional design, ultra-sporty performance and smart plug-in hybrid technology, the i8 is an intriguing option among sports cars. This year, the coupe offers a new Protonic Red edition, which features ceramic and carbon-fiber trim on the interior as well as a Protonic Red paint hue with Frozen Grey metallic accents. The BMW i3 is distinguished by its unique carbon fiber body and zero-emissions, all-electric powertrain, which is now available with a new battery that helps increase range significantly. Continue our 2017 BMW i Series review to learn more! 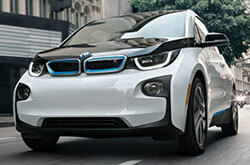 The i3 hatchback and i8 coupe represent innovation at every level. Visit us to explore the 2017 BMW i Series in Lincoln and discover all of the intelligent features the lineup offers. 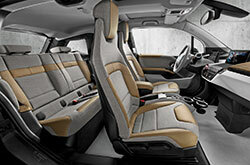 The i3 is available in base and Range Extender models, both of which come standard with heated front seats, navigation, Bluetooth, satellite radio and rear parking sensors. 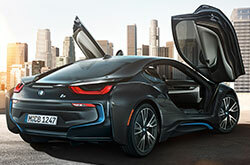 The i8 plug-in hybrid offers many notable standard amenities too, including sporty exterior components like LED lights, 20-inch alloy wheels, scissor doors and front Air Curtains that move airflow to the back vents to cool the car's engine. The all-electric 2017 BMW i3 offers a range of 124 miles with the standard battery and 186 miles with the new larger battery. The hatchback features a 170-horsepower electric motor and automatic transmission. With the all-wheel-drive i8, you'll receive 76 MPGe according to EPA estimates. This is incredibly impressive when you consider that the coupe gets 357 horsepower and 420 lb.-ft. of torque. Stop by our dealership to see the 2017 BMW i Series in Lincoln and take both models for a test spin. The 2017 BMW i Series offers a long list of standard safety features. Equipment includes, but is not limited to, front-impact airbags, side impact airbags, seatbelt pretensioners, traction and stability control, and anti-lock brakes. 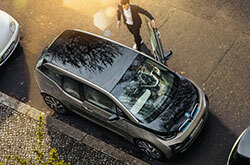 Both the i3 and i8 also include BMW Assist, which helps instantly connect you to roadside assistance whenever you're in a situation that demands attention. Continue BMW of Lincoln's 2017 BMW i Series review below to see inventory, third-party electric and hybrid car comparisons, video and more! 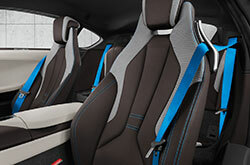 Want to Review More Info About the BMW i Series? 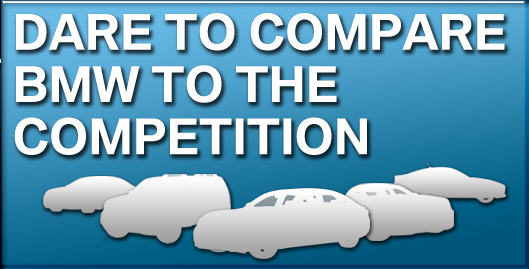 In the market for the 2017 Nissan Leaf, Toyota Prius and the Chevrolet Volt? You should also visit BMW of Lincoln to take a look at the handsome 2017 BMW i Series and find out why it's a fabulous option. Thanks to its top-shelf features and other qualities, it could end up being a definite match for you. See if the 2017 BMW i Series is a best bet for your specific needs, then browse our site to find the latest information on exclusive offers. Among our large assortment of cars, the BMW i Series is a sought-after option at our BMW dealership. After viewing our 2017 BMW i Series review, be mindful of the info that you found worthwhile; it'll help you make a responsible vehicle purchase that you won't feel doubtful of. We have a lot of BMW i Series models for sale at BMW of Lincoln; stop by to enjoy a test drive - sending a request for an appointment ahead of time is easy. Take a look at our video for a glance at its polished design preceding your visit.